Originally this was a pastel sketch I did of a view from the 3rd floor studio of my South Philly home. I didn't like it so I cut it up into squares and glued it on another piece of paper making it a grid. I always liked the result and thought it would make a nice large painting one day. When I was approached by Inliquid to participate in a mural show showing experimental work, I thought my city grid would be a good subject. I duplicated the drawing in Photoshop, reversed the duplicate and made it monochromatic to evoke a sense of evening time next to the squares with daytime colors. 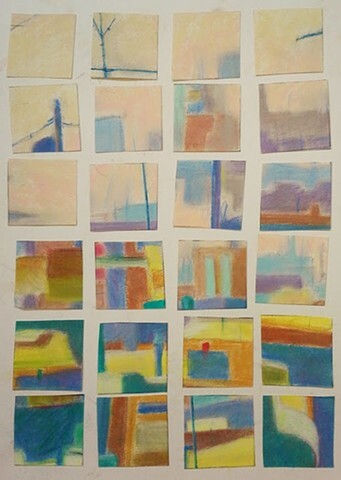 I tore 48 pieces of cotton canvas and painted each of the tiny squares onto 16 x 16 inch canvas pieces. I pinned each square to the wall making sure it was lined up properly on a grid.